Up to now we have been concentrating on events in France during the sixteenth and seventeenth centuries. You may have noticed that I have not mentioned any French references to the canary during that period. That is because I have not found any! For early references to the canary we have to look to other countries, always with the caveat that national boundaries have changed a lot over the last four hundred years. For example, the countries that we now know as Holland, Italy and Germany were little more than clusters of princely states with a common language and shifting alliances. Even Great Britain did not come into existence until 1707 when the Acts of Union brought Scotland, England and Wales together as a political entity. Others, like Prussia, have disappeared. Although the European colonisation of the Canary Islands had started in the fourteenth century, it is not until the sixteenth century, and the spread of printing, that we find descriptions of the birds themselves. This was the dawn of ornithology, although it was hardly a science at this stage. The earliest books were more like encyclopaedias, combining descriptions of birds and their habits with folklore and classical mythology from the writings of Aristotle and Pliny. The canary was rare and not many writers were familiar with it. Neither of the two pioneering authors, Pierre Belon (France) and Conrad Gesner (Switzerland), who by a remarkable coincidence both published major ornithological works in 1555, had seen it (1). Belon made no mention of it, while Gesner relied on reports from others (2). 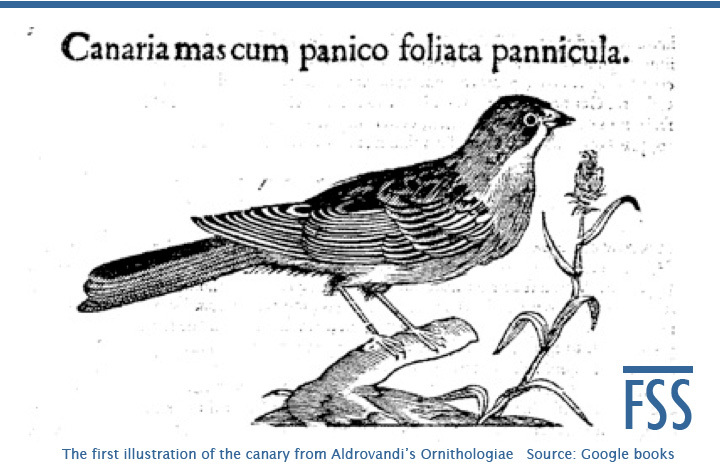 The first illustration of the canary appears in Aldrovandi’s Ornithologiae, tomus Alter (1600), which you can see at the head of this article. It’s not a great likeness, and the description is just an embellishment of Gesner’s text (it was Aldrovandi who tells us the origins of the name canariae). It also seems that canaries were becoming more widely available because he gives advice on how to choose a good singer (apparently small birds were best), and warns his readers to beware of fakes (foreign birds being passed off as real canaries to the unwary). Part of the Ornithologiae was translated into English as early as 1613-14 by Edward Topsell, a fellow clergyman and naturalist. Topsell prepared a draft manuscript of the birds in alphabetical order starting with the Alcatraz (Pelican) and finishing with the Cuckoe (cuckoo) as a sampler to attract the support of Lord Ellesmere, the man he hoped would fund the publication of the complete translation. His hopes of patronage came to nothing and the manuscript, which he entitled The Fowles of Haeuen was not published until 1972 (4). Thanks to its alphabetical order, it included the canary. He arranged the canary in three ‘kindes’: the canary, the greenfinch, and a foreign bird which is probably the Chinese Greenfinch. This may seem ridiculous, but we have to remember that people were starting from scratch, trying to make sense of the world around them, and visual similarities were an obvious starting point. Topsell also copied Aldrovandi’s illustrations, but they were rather crude wood-cuts and even less impressive than the original. An even more extensively illustrated work was published in Rome in 1622: Giovanni Pietro Olina’s Uccelliera (5). As far as canaries are concerned, much of what Olina wrote was an update of Aldrovandi. We can see a pattern beginning to develop here: authors modifying previous writings rather than describing the birds from their own observations. Again, folklore is prominent. It was Olina who is responsible for spreading the story of how canaries became established on the island of Elba following a shipwreck. It is frequently repeated as fact in bird books and magazines, but has been debunked by Tim Birkead (6). Biographical information is limited, but it seems that Olina had his own collection of singing birds, and advocated playing music to them to improve their song. His familiarity with the birds may explain why the illustration actually looks something like a wild canary. Sadly, this was the zenith of the contribution made by Italian writers to the early history of the canary. Henceforth, all the advancements would made in northern Europe. That is where we will return in the next chapter. L’Histoire de la nature des oyseaux by Pierre Belon (1555). Historiae Animalium, Vol 3: De Avium Natura by Conrad Gesner (1555). Gesner relied on correspondence with William Turner (England) and Seiler (Bavaria). Turner was the author of Avium praecipuarum (1544), the first book devoted to birds. The original Latin states: Ob hanc ipsam delicatam cantus suavitatem, et quod e remotissimis locis, per mare procul, deinde terra quoque longe, summa cura et diligentia non nisi rara asportatur, magnatum aedibus alitur. Most writers use Ray’s translation (1678), but this was a mixture of Gesner and Aldrovandi’s writings, not Gesner’s original text. The Fowles of Haeuen by Edward Topsell, edited by Thomas Harrison and David Hoeniger (1972). The full title is Uccelliera, owero discorso della natura e proprietà di diversi uccelli e in particolare di que’ che cantano, con il modo di prendergli, conoscergli, allevargli e mantenergli e con le figure. intagliate in rame da Tempesta e Villamena (Aviary, or a discourse of the nature and properties of different birds and in particular of those who sing, with how to take, know, breed and keep them, with the figures engraved by Tempesta and Villamena). Fortunately it is generally known as Uccelliera. The Red Canary, Tim Birkhead, 2003, p.84. Tim also gives an insight into the political maneouvering behind the publication of the Uccelliera, which was intended to promote his patron’s chances of being elected to the Accademia dei Lincei. It worked..